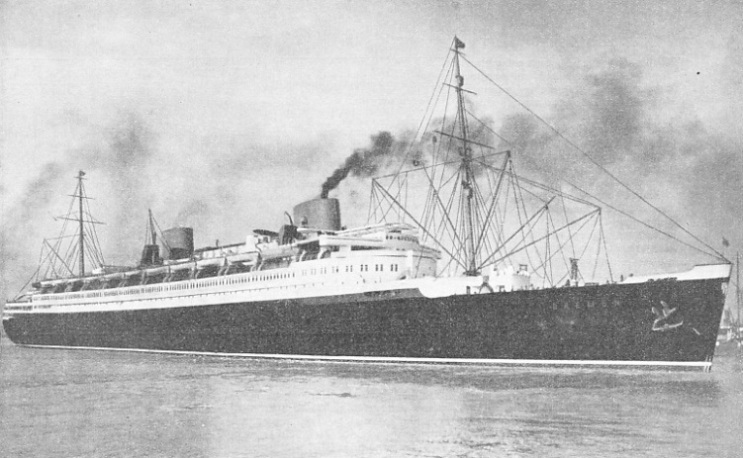 THE PRIDE OF A NATION - the North German Lloyd quadruple-screw turbine express liner Bremen. The keel of this ship was laid in June 1927. Her launch took place in August, 1928. In less than a year later, the Bremen made her first voyage to America, when she crossed the Atlantic from Cherbourg to New York in four days seventeen hours forty-two minutes, thus setting up a new record and gaining the coveted “Blue Riband”. During the passage the Bremen attained an average speed of 27·83 knots. A great liner’s departure from port rouses feelings of high hope, adventure and romance. It is a big moment and even the most hardened traveller does not become wholly accustomed to it. Sometimes this departure is accompanied by ceremony and festivities. When the R.M.S. Empress of Britain leaves, many-coloured streamers are cast down to the quay below. As the ship is taken slowly out into midstream these streamers break from her, reluctantly, it seems, as if those who are holding them are anxious to maintain this last friendly link between ship and port. The departure of the two German super-ships, Bremen and Europa, is accompanied by the playing of a band. The bigness of the moment is emphasized by the music. The echoes of that music remain when the ship is many miles out. Sailing-day is only one of the many memorable things for a passenger in either the Bremen or the Europa. T hese two ships are sister ships and were launched on successive days in August, 1928. Their dimensions are approximately the same: thus if we describe one ship we also describe the other. They were both holders of the coveted Blue Riband of the Atlantic. The Bremen crossed from Cherbourg to New York in 4 days 17 hours 42 minutes, beating the Mauretania’s record of 5 days 3 hours 14 minutes. The Bremen’s average speed on the westbound trip was 27·83 knots. On the return, or eastbound, trip she created yet another record, completing the trip in 4 days 14 hours 30 minutes, at an average speed of 27·91 knots. These times have since been bettered by the Bremen. This record-breaking maiden voyage was in July, 1929, and in the following March, the Europa made her maiden voyage also in record time, completing the westbound trip in 4 days 17 hours 6 minutes, at 27·91 knots. With an overall length of 938 ft 8-in a moulded breadth of 101 ft 8½-in and a gross tonnage of 51,656, the Bremen has features which were, at the time of her construction, unique. The stem is cut away in a manner then not at all usual with large ocean-going liners. Tank experiments, and an increased knowledge of stream-lining, made her designers decide to give her a bulb-shaped stem below the waterline, in place of the hitherto universally-used fine stem. This innovation gave the ship buoyancy forward and also prevented her from plunging in rough seas and lifting her propellers. Universal admiration was accorded to the fine performance of the Bremen. 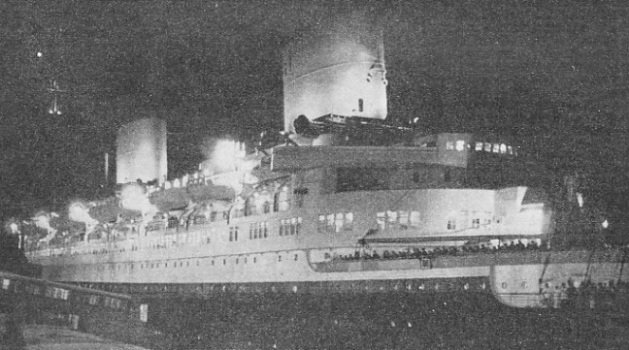 After her first triumphant westbound trip to New York, the ship remained there for five days, during which time some 70,000 people visited her. On the homeward voyage the Bremen set up another record, covering the eastward crossing at an average speed of 27·91 knots in four days fourteen hours thirty minutes. Another innovation gained the Bremen a slight increase in speed. The plates on the hull overlap forward instead of aft, so that as the water runs along the side of the ship it meets a series of blunt edges. These experiments, which are common to both ships, have been followed with intense interest by the shipping world, and they have proved to be successful. If the Bremen and the Europa are fast ships they are also comfortable ships, two qualities which, in the past, have not always gone together. 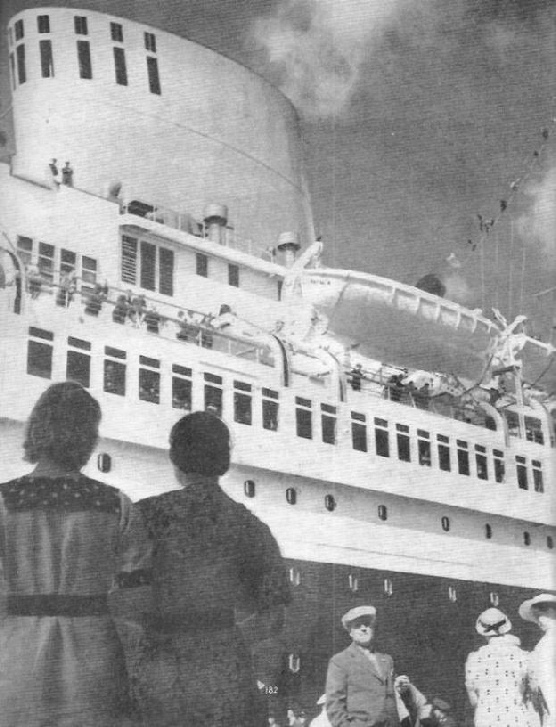 If a passenger wishes to get to America in fewer than five days he also wants to get there in comfort, and the owners of the Bremen and the Europa were determined from the outset that this should be so. Comfort must not be sacrificed on the altar of speed. The future of shipping may see faster and larger ships than the two vessels that have done so much towards regaining German maritime power and prestige, but they must all provide comfort. The passengers, numbering over 2,000 in either ship, have accommodation that is unsurpassed in its luxury. The first-class section of the Bremen can take 732 passengers, and the cabins in which they are accommodated have mahogany bedsteads, fitted wardrobes, bedside tables, dressing-chests - which may also be used as writing-tables - and easy chairs. All cabins have basins with running hot and cold water; the baths have cold fresh water as well as hot and cold sea water. In the suites de luxe, no two sets are decorated alike. These suites de luxe are situated in the middle section of B Deck, on both the port and starboard sides of the ship. A special ante-room leads to the drawing-room and bedroom of each suite. Adjoining the bedroom is a wash-room leading to a bath-room. If the drawing-room is used as an extra bedroom another wash-room is provided. The public rooms in the first-class section are not only a triumphant combination of utility and beauty, but also they are notable for the striking designs, carried out by some of the leading German artists. The dining saloon extends upwards through three of the eleven decks and can accommodate 600 people. The colour scheme is carried out in ivory, sea-green and gold. Indirect and direct lighting give a soft and beautiful effect to the entire saloon. A djoining this is the famous Porcelain Room, which contains the special dining-rooms. The walls of this room are covered with porcelain Dutch tiles, and the centre wall has a relief of the late President Hindenburg, who sponsored the launch of the ship on August 16, 1928. The other special dining-room is on the port side, and is known as the Hunt Room, the walls of which are decorated with charming Gobelin tapestries. The passenger accommodation in the other classes is equally up-to-date and most comfortable. All the public rooms in the Bremen call for description, but they are so numerous that they need a chapter to themselves. In this great ship there is so much to see, however, and we have little time in which to see it. Thus we must content ourselves with a visit to parts that can be accepted as typical of the design and lay-out. SPECIAL UNSINKABLE LIFEBOATS form part of the equipment of the Bremen and the Europa. All the lifeboats are motor-driven. The motor is watertight-encased and can operate even if water is in the boat. The capacity of each boat is 145 persons and provides seating space for all. The boats can be launched simultaneously. resort. An air-pearling device on the floor of the bath distributes sea air throughout. Large round lunettes and inserted parabola reflectors convey mighty rays of light into the bath. These reflectors not only give a wonderful lighting effect, but they are also of therapeutic benefit to the body. Realism is obtained from constantly-moving water. This is achieved through the water being sucked off by means of a special pump installed at the deep end of the bath and readmitted at the shallow end through a water cascade device. In every way the Bremen and the Europa live up to the title of floating cities. There is no amenity of civilized life that cannot be obtained in either of these super-ships. Every form of popular recreation is provided, including gymnasiums, rifle ranges, cinemas and ballrooms. 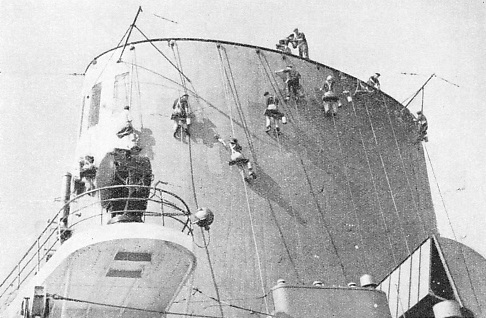 CLEANERS AT WORK on the funnels of one of the great German liners. 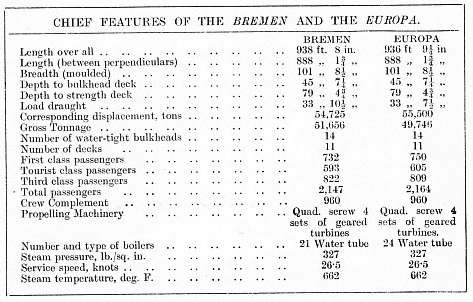 The two funnels of the Bremen are 49 by 20 feet in diameter. Those of the sister-ship Europa measure 59 by 22 feet. for a trip on either of these two vessels at the shortest possible notice, and without having to make any special preparations so far as clothes are concerned. This is true, since the ships have a variety of shops. The shopping promenade in the Bremen is world-famous. This is approximately 8 feet wide and 49 feet long. The pear-wood-and-gold walls and enclosures of the built-in show cases are decorated in blue and yellow, and lined with pigskin. 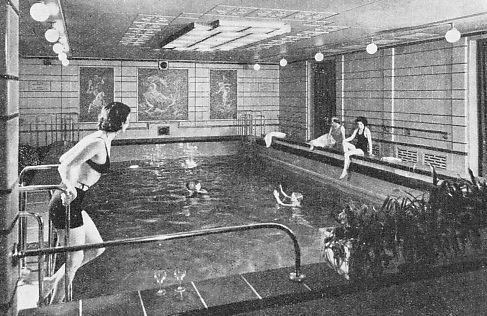 THE SWIMMING POOL in the Europa is 36 feet long and 19½ feet wide and lined with blue-green glazed tiles. The bath can be filled to a height of 5½ feet or 3 feet. Fresh air is forced into the water under pressure, and to keep it at a uniform temperature, the water can be whirled round by a gyro-pump. At the same time it is brought to the required temperature by a special heater. The pool is brilliantly illuminated. The Europa has no shopping promenade, but she is equally well supplied with shops. Now we must take a trip behind the scenes. We must see and admire the organization that enables these two leviathans to be the acme of comfort, speed and safety. 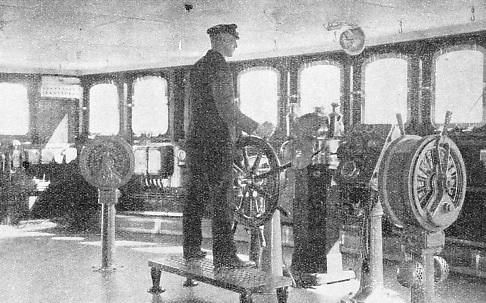 Let us go down into the engine-rooms, to the very heart of the ship, where men watch pressure gauges and delicate instruments ceaselessly, day and night, so that the schedules shall be maintained. The technical details of these two ships are substantially the same, and if we describe those of the Europa they will also serve for those of the Bremen. 84,000 shaft hp, which, to attain a speed of, say, 27 knots, must be increased to 105,000 shaft hp. The boiler plant is also divided into two separate and independent main groups. It consists of twenty water-tube boilers with a total heating area of 180,800 sq ft. Each boiler generates steam by burning oil fuel. As soon as the steam passes through the turbines, four condensers and other complementary gear re-convert it to water, used to feed the boilers. Each set of turbines has an independent condenser with approximately 10,250 cooling tubes. Cooling water taken from the sea totals about 32,000 tons an hour. AT THE WHEEL. The helmsman in the wheel-house of the Bremen. Electricity and wireless play a leading role in the guiding of this great liner, which has a gross tonnage of 51,656 an overall length of 938 ft 8-in, a moulded breadth of 101 ft 8½-in and a load draught of 33 ft 10½-in. All orders from the bridge are electrically transmitted. For communicating with various points in the ship forty-six telephones and a network of speaking tubes have been installed. numerous refrigerators, the fresh water coolers and also to the air coolers. Electric lights, electric current for the operation of the twenty-three electric lifts and the 10,000 bells in the Europa are also the concern of the passenger. The electric current for lighting and power is guaranteed by four large Diesel dynamos installed in a special auxiliary engine-room. This Diesel plant enables 420 motors and auxiliary engines to be set working. It also supplies current to more than 20,000 bulbs; the Bremen’s plant supplies over 30,000 bulbs. When either the Bremen or the Europa passes another ship at night she lights up her name, the letters of which are prominently displayed on the starboard and port sides of the sun-deck restaurant . No fewer than 1,200 bulbs are required to illuminate these letters. There have been many “unsinkable” ships. The history of the sea is besmirched with the tragic untruth of this description. But it can be said of the Bremen and the Europa that two safer ships have never been launched. The pumps and auxiliary plants in these vessels are driven partly by steam and partly by electricity. A vast reserve power is on hand so that the working of the ship cannot be handicapped or endangered. THE EUROPA BY NIGHT. This ship made her first outward voyage to New York in March, 1930. The vessel maintained an almost continuous speed of 28 knots and crossed the Atlantic in four days seventeen hours six minutes, thus beating the record of her sister ship Bremen by thirty-six minutes. The Europa has a gross tonnage of 49,746, an overall length of 936 ft 9¼-in and a moulded breadth of 101 ft 8½-in. Her total passenger capacity is 2,164. Her load draught is 33 ft 7½-in. Both ships have a double bottom that runs the length of the vessels from bow to stern and is sub-divided into fifteen watertight compartments by fourteen watertight bulkheads. The reserve of buoyancy has been so arranged that in the event of two adjacent watertight compartments being filled with water it is impossible for either ship to sink. But there is an even greater proof of safety. In the aft of these ships three adjacent compartments, and in the fore part as many as four adjacent compartments, could be filled with water and the ships would not only float, but could also proceed on their voyage. The lifeboat apparatus in these ships is unsurpassed. The Bremen and the Europa have large unsinkable lifeboats, which are motor-driven. The motor is encased, and if any boat should be filled with water the motor can still function. The boats each hold 145 people, and all passengers and crew can be comfortably seated. In the event of a sudden alarm the boats can be lowered simultaneously. The horror of shipwreck has no place on a voyage in either of these large liners, nor does the fire terror - which is perhaps even worse than that of shipwreck - exist. There is an extensive fire-extinguishing plant, a number of hand apparatus and fire-extinguishing pumps - which can eject about 45,900 cubic feet an hour. 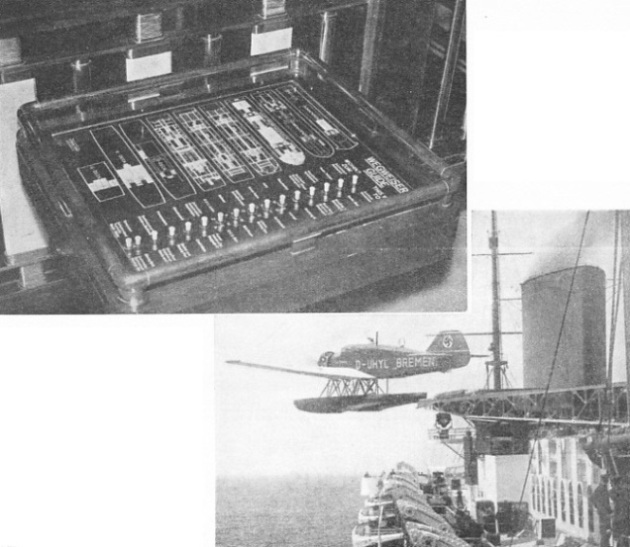 Fire alarms, operated by pressing a button, are distributed throughout the ships. In front of the two funnels in either ship, two electric fog-bells have been erected. All orders from the bridge are transmitted by electricity. Even this is not the limit to the number of safety devices. These include the long and short-wave radio transmitters, the wireless telephone, a gyro-compass with automatic steerer, the radio direction finder and the submarine acoustic plant. For finding the depth of the sea a modern echo depth-finder is used. We cannot conclude our brief tour of these two ships without a reference to the catapult aeroplane in the Bremen. This device enables the mails to reach Bremerhaven or New York many hours earlier than if they had been transhipped in the usual way. Three days have been saved on the delivery of mails between New York and Berlin. The catapult plant itself is erected on a wheel-rim and rotates on a pin so that it can be swung round to either side of the ship. Planes up to a total weight of 3½ tons can be started from the catapult. The aircraft used in the Bremen can maintain an average speed of 118 mph and can carry approximately 440 lb of mail. Ships of beauty, record-breakers, leaders of their country’s maritime revival, the Bremen and the Europa have added a new, yet significant, chapter to the history of transatlantic travel. AN ELECTRICAL GUIDE in the Bremen, to enable passengers to find their way about the decks of the vast ship. The passenger presses the appropriate button, and his route is illuminated on the panel. 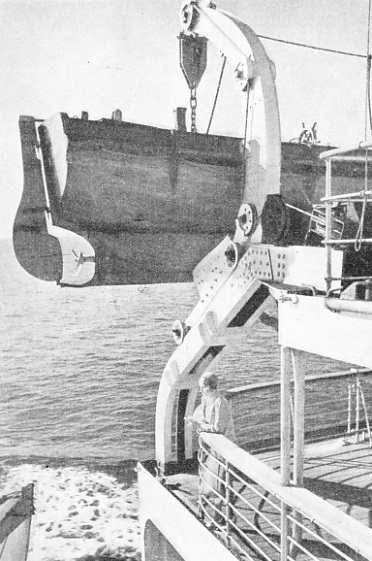 A mail-carrying seaplane being catapulted from the sun-deck of the Bremen. With the aid of this seaplane a record time of five days eleven hours for mails between New York and Berlin was set up on the first eastbound voyage. This represented a saving of three days on previous times.